Matthew Brumlow committed his life to theater the way that some people commit to a life in ministry. For Brumlow the two passions share similar hearts. “I consider theater to be the best kind of church,” said Brumlow, a Master of Fine Arts candidate studying in the Department of Theatre Arts in the University of Idaho’s College of Letters, Arts and Social Sciences. Brumlow grew up in Conyers, Georgia, spending Sundays at his uncle’s evangelical church, a diverse and charismatic Southern congregation. Weekly services were sometimes rowdy, Brumlow said, with live bands, loud music and no fear of being too expressive or emotional. While pursuing an undergraduate degree in English at Lee University in Cleveland, Tennessee, Brumlow had the opportunity to study abroad at Cambridge University in England. It was there, while watching a performance of “Macbeth” by the Royal Shakespeare Company at Stratford, that Brumlow said he experienced an epiphany. “It was like the best church service that I can remember as a kid, but turned up to an 11,” he said. “That entire experience impacted me. I was frightened, exhilarated, mesmerized, and alive in a way that I hadn’t been before. Brumlow earned a Master of Arts in theater with an emphasis in acting from Northwestern University. He then joined Chicago’s American Blues Theater. He became an equity actor after a national tour of “A “Streetcar Named Desire,” in which he played Stanley. An award-winning actor, Brumlow has played lead roles on Chicago stages and at top regional theaters across the country. Brumlow said the stage and worship services of his youth have much in common. After two decades acting in Chicago, Brumlow felt the call to teach the craft of acting and try his hand at directing, as well. 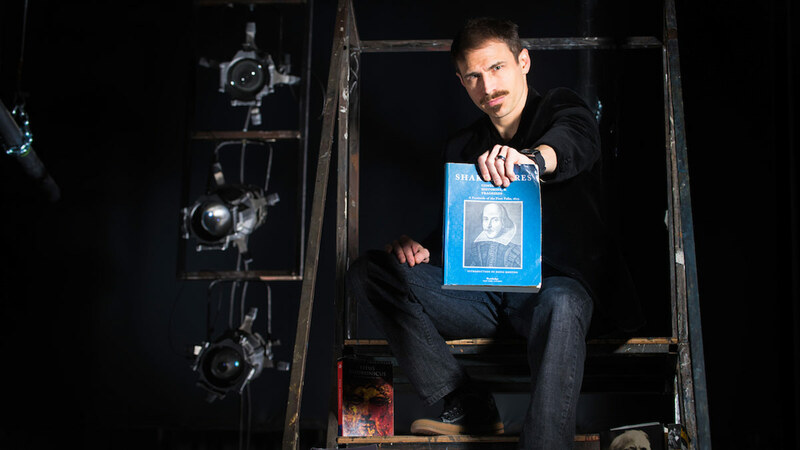 Brumlow met Matt Foss, assistant professor of theatre arts at UI, through Montana Shakespeare in the Parks. Foss encouraged him to check out UI’s MFA in directing. His experience in Moscow has been rich and inspirational, Brumlow said. This February, Brumlow is directing the early Shakespeare revenge classic, “Titus Andronicus,” as his final project. It’s a daunting task and Brumlow said the play is avoided by many directors who perceive it as too clunky or just too brutal. Brumlow sees it differently. And, Brumlow isn’t afraid of a challenge. UI Theatre Arts presents “Titus Andronicus” by William Shakespeare. Adapted and directed by Matthew Brumlow. At the Hartung Theater, 625 Stadium Drive, Moscow. Tickets at BookPeople of Moscow, or by calling 208-885-6465 or at the door an hour before curtain. Warning: This show contains violence and scenes that some people may find disturbing. Not suitable for young children.